In the Edo period publication the ‘Unyoushi’ both Ootoshi Myoujin and Oomiya- Jinja are listed. 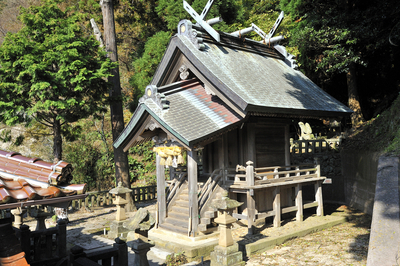 While they were originally different shrines, Ootoshi Daimyoujin and the current Oomiya- Jinja ended up enshrined together. The original shrine location for Ootoshi Myoujin has not been confirmed as yet but it’s hoped that ongoing interview surveys, studies into old naming systems and shrine location investigations will uncover this in the future. The names of the enshrined deities for Oomiya –jinja, Shinatsuhiko and Shinatsuhime both contain the word ‘shinaga’ which means ‘wind’, making them wind deities. The seas of Japan gets wind from the North West and these kami are worshipped as guardians of fishing boats in this part of the sea. The shrine is located in the center of the village near the beach. It stands a little way up a flight of stone steps off the prefectural road so is a little hard to find. The main hall of the shrine is adorned with a votive picture (ema) of a still vividly blue Kitamaebune ship. It leaves a strong impression. The enshrined deity Shinatsuhiko-no-kami, a child of Izanagi and Izanami, is viewed as a kami of wind who helps calm down violent gales. This same kami is enshrined at Ise-jingu in the ‘Kazahinominomiya’ shrine following the Mongol Invasions in the 13th Century when a great typhoon, or 'divine wind' was believed to have protected Japan from its attackers by halting their advance across the seas. Following this, its status was elevated and it was and consequently worshipped at when praying for the protection of the country during subsequent wars with other nations. In Udo, like Sagi-ura, one can see the remains of a pit head left over from its former copper mining days. The nearby river still flows red with what's believed to be the metallic residue from the copper. There is a stone stake delineating the mountain border on the ridge of 'Dragon Mountain' with Sagi-ura to the West and Udo to the East. The somewhat low mountain to the West is known as 'west Dragon' with the area covered by the Sagi Copper Mine. The Udo Mine is on the East. It was opened following a fall in output from the Sagi Mine and is said to have stayed operational until Showa 45 (1970). 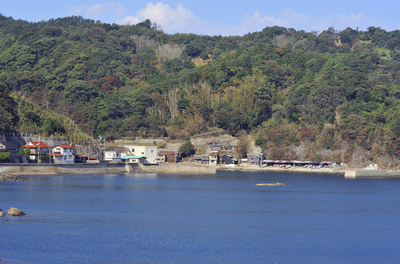 Midway between Udo and Sagi-ura occupying the former location of 'Usagi Elementary School' is the 'Usagi Community Center'. On the 2nd floor are exhibitions and storage of a variety of items including records of the Pacific War, Kitamaebune and the mines as well as Showa artifacts and folklore-related materials. The remaining damaged parts and photos of navy craft left over from war times tell us very real and raw stories.